What does it feel like to have a c section? I’ve noticed that there are a lot of articles being written at the moment about having a C Section, why you shouldn’t feel guilty about having one, and from one particularly stupid facebook page, why you are a second class mother if you have had or do have a c section. We lucked out apparently. Brilliant! The thing is, I’m not bothered about the facebook page, its attention seeking and a load of twaddle. What I’ve read from people defending themselves about having a c section, is about how their or their baby’s life was at risk and that’s why they had a c section. It was an emergency, they went through labour and c section. What if you didn’t though. What if you were terrified of giving birth? 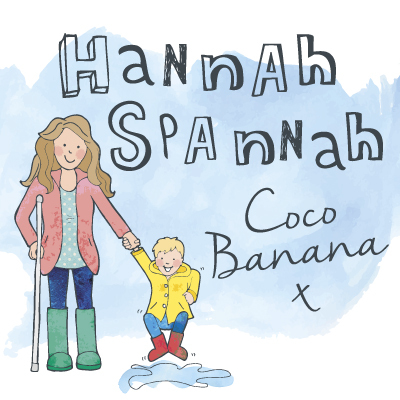 What if you had a horrific experience first time round and wanted a section second time round?What if, like me, you planned your c-section? I can justify my section due to the horrific SPD that I had, the slipped disc and the fact that I had been in a wheelchair and on crutches for 20 weeks. That a midwife had categorically stated that there was no way I could give birth, after another stay in hospital. But why should I? Why do I have to justify anything to anyone? Alcoholic mothers can give birth naturally. Women that neglect their children can birth naturally. Women who abuse, give birth naturally. I have no worries what so ever that I am any less of a mother because I had my son by C section. Now that cr*p is out of the way, you may be planning a section or you may be doing some research just in case, whatever the reason for finding yourself reading this, what does a c section feel like? It’s not that bad. Or at least I didn’t think so. First though, this is the moment my baby was born. Don’t feel sad if you have to have a caesarean section, it can still be a beautiful birth. *I refer to my ex husband as ‘my husband’ in the story as he was then and its easier than writing (now ex) every time I need to mention him! Because mine was planned, I could get everything prepared. I have to say that despite mourning the water birth of my dreams and feeling sad that I wouldn’t know what it was like to ‘give birth’, it was fantastic in that my bag was packed so no half naked running around at 2am, trying to find everything after my waters had broken, my now ex husband booked time off work and all my family were there as I was wheeled back to the ward with my beautiful baby. We drove to the hospital at 10.15am, it was 6 degrees and heavy showers. I wrote those details down on the day so that I could tell my little man when he was older! I was shown to my bed and changed into a hospital gown. If you are going to have a section, be prepared that you have to remove your underwear at this point! You’ll also be weighed. Fabulous. On probably the heaviest day of your life, you will be made to stand on scales for the anaesthetist. You can’t cover the reading up either as they want to see. I actually got a shock! Seems you can put on a fair few pound in the last few weeks! They’ll also give your birth partner some scrubs to wear (and they don’t always transform them into George Clooney in the ER years) Darn it. Then we sat and waited. We were put back an hour or so due to an emergency and then all of sudden, ‘Right Hannah, time to go’. Holy cow! This was it! Usually you walk to theatre if it’s a planned section (with another gown on backwards like a dressing gown so that you don’t flash the public in the corridor) but as I had such a bad back, hips and pelvis, I was wheeled down. Well, we got a few metres down the corridor and the tears started to flow! I know that I wasn’t scared and I wasn’t in that much pain but by the time I was sat in the bed and preparing for the spinal block, I was a blubbering mess and shaking like a leaf! I think I was so overwhelmed, nervous and excited. I did the same on my wedding day and cried from the moment the car arrived at the church, until the moment I reached the altar! My goodness, I was huge. This was 39 weeks + 2 days. I wonder how big I would have been if I’d gone full term or over?! Anyway. The spinal block. The scary bit. Except it wasn’t. I sat on the bed, sideways and as you may have seen on one born or the like, you hug a pillow, relax and lean forward. My lovely midwife let me rest my head on her shoulder and the anaesthetist was fab. There was a bit of a sting from the local anaesthetic and then the spinal block was done and I laid down. I really shouldn’t have been nervous. The numbness will begin but the next thing they do that I wasn’t expecting, is that they tilt the bed to the left so that you’re lying on an angle, not a flat bed. I think this must have something to do with moving your organs out of the way or similar. Let me know if you know the exact reason. Throughout all this, the anaesthetist was chatting to us and keeping my mind off the major surgery that was about to happen. The surgeon’s were pinching me and asking ‘can you feel this?’ to which I replied ‘Yes, I can feel that!’ as strongly as possible in the hope that they wouldn’t cut me! They kept on asking me but were obviously checking other areas that I wasn’t feeling and there was no chance that I was going to get hurt! I had the sensation that I was moving about and the surgeon asked if I was ready for him to start? I replied ‘yes, but I think you already have’. And yes, they had. My consultant on the right, his registrar on the left and my midwife at the back. Next was a whirlwind. I don’t remember feeling uncomfy, it was all a but surreal. The surgeon said that the waters would be any minute and said ‘there they go’. That was que for my husband to stand up and start taking photo’s-thank god he isn’t squeamish as he got some great shots.As you may have seen on tv, you have a screen up so that you’re not watching your own surgery (could be interesting?!!) 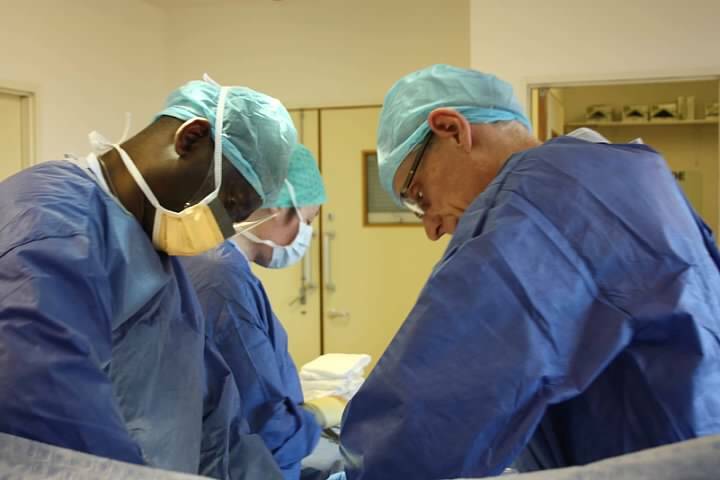 but my surgeon was more than happy to remove that as my son was born so that he was passed straight into my arms and had immediate skin to skin. This was SO important to me. After having lost all of my birth plan (I didn’t even write one in the end! ), I wanted to be the first to hold him and not have him weighed or wrapped up first. 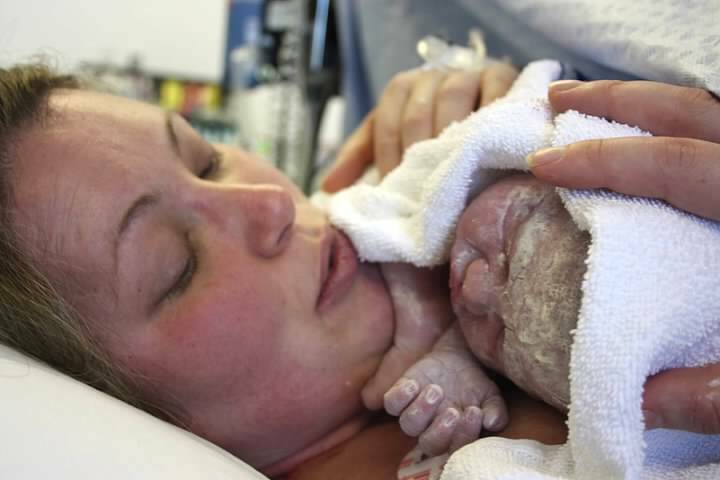 I had wanted a waterbirth, delayed cord clamping and skin to skin but just had to let most of it go. As soon as I held my son though, I did not care one bit how he got there. The surgeons could have chopped my leg off and I wouldn’t have known about it- basically, I lay, holding my so completely in love and watched on as he had cuddles with his Daddy and was weighed. I think it took 30-45 minutes to stitch me up and finish the operation and before I knew it, it was time to head back to the ward. I heard someone say ‘she’s had anti inflammatory and pain killers’ and me being me, had to question it. ‘Have I?’ Is it in the drip?’ No. Suppositories. As in, up your bum. See what I mean about how they could have chopped my leg off?! It is so weird! My c section stats. 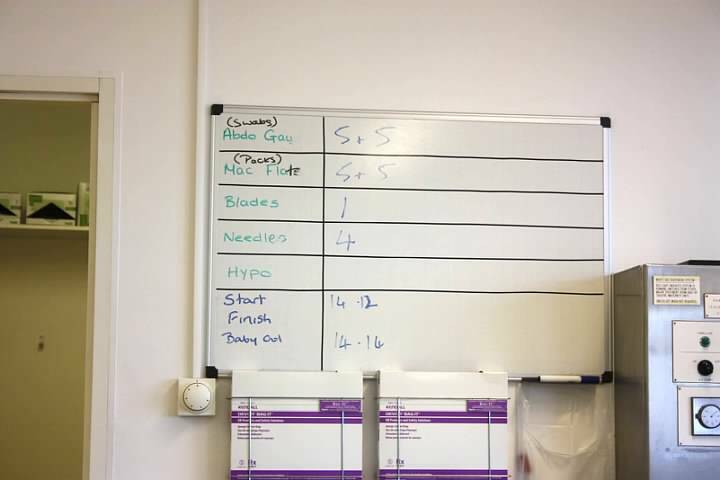 First cut made at 14.12/2.12pm and baby born at 14.14/2.14pm. I told you it was quick! I returned to the ward with a catheter, that to be frank, I have no idea when it was put in, and some rather snazzy self inflating leg warmer thingy majiggy’s that were on until I was able to stand and I think are to stop blood clots. They whirred and squeezed a bit like a blood pressure sleeve on each leg. They didn’t bother me though. Now, what happened next was not normal and could be a bit scary to read about if you’re just about to have a baby so I’ll write it elsewhere and if you want to read it, click here. Obviously though, we’re both here and both fine. It was just a bit crazy for a while and could happen if you give birth naturally or by section. I was really lucky and was given a cot that attached to the bed so that I could manage my little man without having to get up and stand or walk. 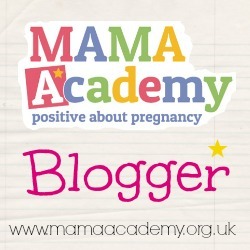 That was brilliant and I suspect that it made a massive difference from having to call a midwife to help me. I’m not sure if I’ve just forgotten it or because I was already on crutches and in pain from the rest of my body, but I don’t remember it being so terrible. Yes, it is major surgery and yes it does hurt but it wasn’t ‘I can’t cope, I’m going to die’ pain. You will walk slow and will probably still waddle to protect yourself (and take it easy on the stairs!) but you will be ok. Just don’t go lifting the pram or the car seat with baby in, in and out when you leave the hospital! I remember needing a cushion near by and dreaded sneezing and my husband was under strict instructions not to make me laugh! Not driving was annoying but get in touch with your insurance company as some insurers will let you drive sooner than 6 weeks post op, if your dr signs you off. One thing that I was not expecting was the numbness! 3.5yrs later, most sensation is back but its taken years. Some people don’t ever get the full feeling back. Basically, I was numb for about the length of the scar + an inch or so at either end, for a rectangle of about an inch below and an inch above. I had a weird sensation but couldn’t really feel much. It is odd, but I only really noticed in the shower or when putting cream on. My scar healed amazingly well and you would hardly know that it was there. I can feel a ridge on the inside but its smooth and flat on the outside and well below my pants line so no one will ever see it at the beach etc. I don’t have anything to compare with but a friend who had her first baby naturally and snapped back into place, went on to have her second by section, just 2 yrs later and was shocked that she has a Mummy pouch that she can’t shift, but it’s not the end of the world and I know people who have had a section that manage to achieve a fat tummy. Maybe I’ll get there myself and be able to confirm! So, I hope that if you have a section coming up, you won’t be too worried about it and agree that it can be a beautiful birth. If you’re not planning a section, make sure that your birth partner and the midwife know that if you do have to a have an emergency section, that as long as the baby is well, you would like to be the first to hold your baby. You can try to have it the way you would like and regain a little bit of comfort and control of the situation. Thanks for reading ‘what does it feel like to have a caesarean section’ and please let me know your thoughts. 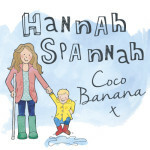 This is great Hannah, I’m loving your blog. The reason they tilt the bed is so that your uterus doesn’t push on your vena cava and cause you to pass out!! Clever you Mrs Akid! I googled it but was unable to find the answer! Do you mind if I amend- I’ll credit you! Thanks for saying you like the blog. I’ve just linked the story of what went wrong so there’s another story and rotten photo’s for you! What a beautiful post. S and I watched your video several times; she was enthralled by it! I think you’re right, in the grand scheme of things there are a million things you could do that would actually damage your child; how they come into the world is really not one of them. Thanks for linking up with the #WeekendBlogHop. Oh bless you, I’m glad S liked it! I can’t stop watching it- little man does too. Thanks for this honest post and the video. It really made me smile. Having given birth both ways I can definately confirm that you do not feel any different about your children however it happens. They are your world from the moment they are born. 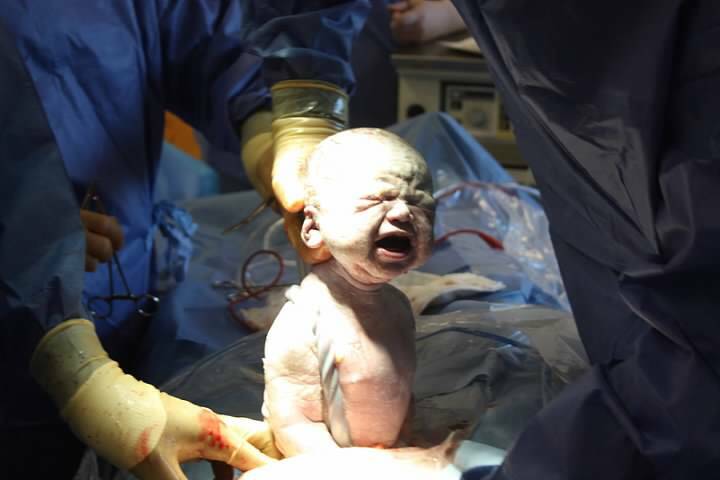 My c-section wasn’t nearly as traumatic as Hannah’s was. I had a planned section due to my daughter being breech and I was so excited, everything that you think is going to be scary, just passes you by really. It is amazing how childbirth turns you into the superhuman being that you always knew was there somewhere! Neither of my boys were born by C section, but I get annoyed myself by people claiming a C section is the easy way after watching my friend recovering after hers! How on earth can major surgery and the long recovery period be the ‘easy’ way?! Also I had stitches somewhere private 😉 so I can understand what you mean about the not wanting to sneeze bit, stitches and sneezes really don’t go together ouch!